First, tell me a little bit about your career path. Where are you today, and how did you land in your current role? I am currently the Manager of Market Development for Greenworks Lending. Greenworks Lending is the largest provider of commercial property assessed clean energy (C-PACE) in the country. In this role, I’m really tasked with two things. One is turning leads and prospects into closed transactions, so working with building owners around the country to improve the efficiency of their buildings, or to install renewable generation sources such as solar on their buildings. I help them finance projects by using C-PACE as the tool. So, a big part of my role is project development, and working with these commercial real estate developers, building owners and contractors to develop projects across the country. Another part of my current role is working with C-PACE programs across the country. I give feedback on how to build PACE programs that are market-friendly, in order to funnel investment into their community. Commercial PACE is where the PPA was 10 years ago. Ten to fifteen years ago, the PPA was a new source of financing and payment for renewable energy. It sounded cool but was complex and hard to wrap your head around. But now everyone knows what a PPA is. Big companies like Google, Amazon, Walmart have PPAs. So I think over time, commercial PACE will become a more default financing mechanism for energy efficiency and renewable energy projects, as well as commercial energy finance writ large. It’s a really interesting sector of the space to be in. It’s touching on a lot of different aspects: commercial real estate meets green building practices meets finance. I believe it’s very important for the future, especially if we’re going meet our greenhouse gas emission goals and create a new economy that’s powered by green energy. How did I get to that? CELI helped me get there. Back in the day, when I first moved to DC, I was working for a firm called Nextility, and that’s how I first learned about CELI. Jackie Weidman, CELI’s Executive Director at the time, connected me with my current boss, and the rest is history. At what point did you become involved in CELI’s leadership team, and what’s your current role on the leadership team? I first became aware of CELI in the winter of 2014. I went to Saufhouse in DuPont for my first CELI happy hour; there were several people at my old firm who had gone through the program and recommended I look into it. 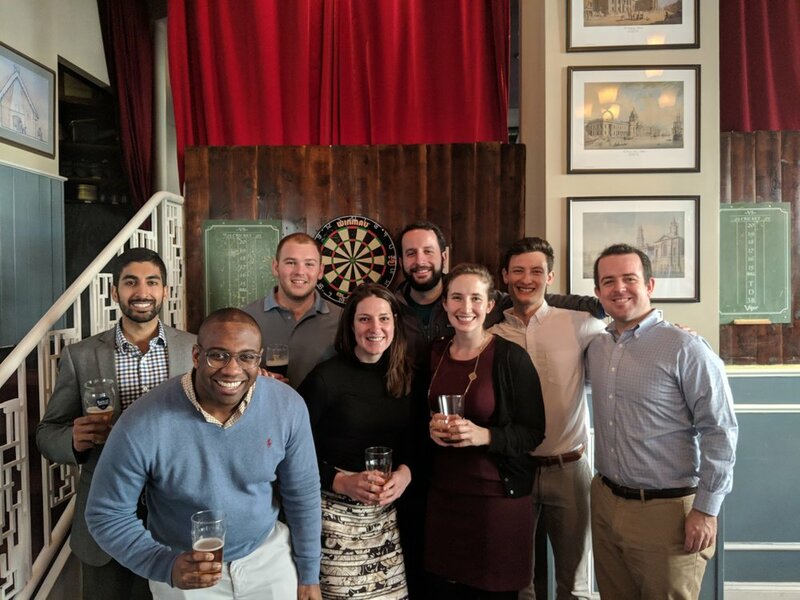 I loved conversing with the group at the happy hour and seeing all the sectors of the DC clean energy space represented. As someone who had literally just started working in clean energy the month before, I thought it was the perfect opportunity. I applied and was accepted as a spring 2015 fellow. Once you’re a fellow, you’re always a fellow. After my fellowship was over, I stayed involved in the program through the annual 5K run, happy hours, and as a speaker at the bootcamps. That eventually led me to jump into a formal role on the leadership team in spring 2018. We created a new position: Manager of Diversity and Inclusion. My role is two-fold: first, I help ensure that we are incorporating diversity in our outreach and recruitment efforts. We want to make sure that we’re using best practices when it comes to diversity and inclusion (D&I), to make sure we’re getting a diverse application pool and ultimately a diverse fellowship class. We’re looking at all types of diversity: racial diversity as well as professional diversity. Professional diversity is important to make sure we have differing perspectives in the clean energy space represented in our classes and our communities; that’s only going to make us stronger. The second piece of my role on the leadership team is working on building and developing partnerships with historically underrepresented groups, which tend to have the most exposure to climate change. I help CELI forge partnerships with institutions and organizations that work with those groups of Americans, with the goal of building long-lasting partnerships with diverse outlets in America. Digging a little bit more into your diversity and inclusion work on the leadership team, it is an exciting new role on our team. What are some of your goals in the near term? I think that CELI can position ourselves to be a recognizable face in communities that are under-represented in America, and that face the most exposure to climate change. Unfortunately, with how our economy is structured and due to institutional and systemic issues, underrepresented groups tend to be on the lower end of the socioeconomic scale. And they also tend to be at the most at risk of sea level rise, exposure to toxic chemicals, and in areas with primarily fossil fuel electricity generation. For me, I think it’s important to not only be there for those communities but also to show those communities that clean energy should be their issue. In doing so, we need to show that there are underrepresented groups working in the industry. Without doing that, we can alienate people. If I’m able to say, “I’m an African American, I’m working in this space, and I’m helping to make sure that everyone gets to take advantage of clean energy and the green economy,” we can make a difference. That’s where I want CELI to be. I want us to be out there partnering with groups like the NAACP, Green Muslims, and Green for All. These groups are doing great work in the environmental justice community, in Latino communities, and in black communities, and CELI should have relationships and partnerships with these communities. It will only do the world good. Imagine if we’re working with the NAACP on recruitment or sponsorships; when, say, Democratic nominee Kamala Harris is speaking at the NAACP, and talking about environmental justice, CELI could be recognized on the national stage. That’s good for all of us and that’s how I want to position CELI in the D&I space. You mentioned that there are a couple key partnerships that CELI could forge to grow our reach. What are some other ways that CELI could position ourselves as a leader in diversity and inclusion over the next 5 years? What are some initiatives that you’ll be taking on? The number one thing is growing leaders. In 5 years, hopefully we have folks who’ve gone through the CELI program and who are very senior in their company, or have even started their own company. If we could have, for example, Asian Americans, Latinos, African Americans, and LGBTQ Americans leading those companies and in the boardroom when key decisions are made, that’s ultimately our most important mission. We should be training leaders that look like the communities they’re trying to serve. That’s what we should be trying to do over the next 5 years. I also think that over the next 5 years as we continue to grow as an organization, and as people in our network continue to grow professionally, being thought leaders in the space and having a wealth of experience will help, but it’s also important to speak the language of those in the communities. For someone who’s gone through our program, not only will they be able to talk through the technical aspects of our industry, but they’ll be able to speak the language of the people they’re trying to help out. So it’s important to be thought leaders in our own space but also within our own communities. Those are two things I think about: thought leadership and creating leaders. In addition to forming partnerships, that will be very important to us in the long term. Why was emPOWER, CELI’s first ever conference, a powerful conference in our industry? As someone who’s gone to several conferences in the clean energy sector, they are not the most diverse gatherings in the world. So, I think by having an event that’s specifically raising the topic of diversity & inclusion within our sector and community, it’s pretty unique right off the bat. A lot of companies will have a D&I section on their website and will talk about it when they’re interviewing candidates, but we have a lot of work to do. Talking about it is the first step to addressing the issue. As an African American, I believe the clean energy space needs to be more diverse. Our industry is very progressive in some ways, but it’s not that progressive in terms of D&I. We can do better, and America is diverse, so our community should be diverse. emPOWER raised that issue and I think helped people think about ways can they create internal change within their own companies, to make sure D&I is at the forefront of not only hiring but of their corporate culture. That will hopefully bubble up to our community’s culture and our sector’s culture. How did the conference raise the topic of diversity and inclusion? One of the panels specifically talked about diversity and inclusion. It focused on what it takes to be a good ally. It’s not as easy as saying “I support that.” I hope that conversation was eye-opening for some folks. Also, having a conversation about female entrepreneurs or women doing great work in the space is really important; CELI is around 51-52% female, so being able to showcase successful women and mothers in the clean energy space was really special. You talked a lot about your vision for CELI and what you’re hoping the next 5 years will bring. What do you think makes CELI great, and what gets you out of bed in the morning excited to dedicate your free time to this cause? I think CELI is great for a lot of reasons, but I’ve always been blown away by the wealth of knowledge that exists in the community. There are certain conversations bounced around in the CELI listserv where I think to myself, “what is this?” Within an hour you get 5 responses, and you realize how smart our community is. We are truly leaders of our space. Groups like this show that young people care, and we are the ones solving problems. Groups like us are going to move us forward; we’re building stuff that people have not built before. We’re coming up with policies and concepts that are really changing the world. That’s why I believe in CELI and why I think it’s important for our organization to continue to move forward. Applications for CELI’s 2019 Fellowship close on January 13, 2019. Join us this Friday, January 11th in downtown Washington, DC to meet CELI Alumni and learn more about our Fellowship.